If we don’t feel a response to our attitude, then there is a problem. It is as if we are up against a wall and cannot change it, nor can we change ourselves by it. In that case there is no connection among us. It may be absolute hatred or absolute love, it doesn’t really matter, but if we are up against something that doesn’t change, then we cannot change our attitude towards it either. If I don’t change, I feel that I am dead, since the feeling of life is determined by changes. So if I cannot add anything to my love and the other side cannot add anything or summon anything in me, then we find ourselves in a very problematic situation. It is true that the attainment of absolute love is the goal of our relationship with the Creator, but this is only if we rise above and build our love on mutual bestowal by restricting our ego. I conceal myself from the love of the Creator and accept it only as fuel that enables me to love Him. I receive pleasure only by bestowing upon Him. So this absolute love doesn’t annul our feeling towards one another, but rather allows us to develop them more. The end of correction is the end of the correction of the vessels, but not the end of the growth of bestowal. Bestowal has no limits, and so this state is called the world of Ein Sof (Infinity). The desire to receive has limits and an end, and the intention also has limits and an end, but there is no end to our ability to rise above our desire to receive with the right intention. During the process of integral discussions, it doesn’t matter whether you are right or wrong. For me it is only a way to “come out of myself” and turn into another person. In this way I begin to understand how it is possible to feel others within me. We must reach a state when we will begin to feel the common opinion, the common desire, the common mind. Moreover, it doesn’t matter whether the answers of others are correct because there are only ten small egoists gathered in the circle. People in the group can be on different levels of development and their answers can be absolute nonsense. But this does not matter to me. I do not want to be clever. I am working on rising above my reason. So when I listen to the answer of another, I only care about including myself in him, understanding him; I am ready to be with my friend in his answer and come out of myself as if I were turning into him. What matters to me is the action because during the process of the dialog, the ability to acquire a new sensor, a new collective sense, appears when I perceive and analyze everything outside of myself, outside of my egoism. I acquire the exit from my isolated inner world. In the end, I begin to perceive that I am included in others. It is important for me to hold on to this common state, our common interconnection that is born between us—the common desire and the common mind. Moreover, this common desire and common mind repeatedly interact between us in such a way that eventually something that we refer to as the center of the group appears. The center of the group is the image of an integral person who consists of a single heart (desires) and a single mind (thoughts). Question: You have said that when we study the integral method, we begin to perceive the negative qualities of other people as positive. What does this mean? Answer: This means that until I rise above my egoism, I do not see others, I only see myself. But when I rise above myself, I suddenly begin to appreciate another person the way he appreciates himself. In other words, I see that his actions are good and proper. I was wrong to appraise him the way I did from my prior egoistic point of view. Comment: Then we have not only the collapse of the subjective “I,” but also the crumbling of all the ethics. Answer: There are no ethics in our egoism, nothing but trying to take as much as possible and pushing everyone as far away as possible. I am speaking about our nature. When we look at another person, we try to find faults in him, feel that he is beneath us, and that we are better than him. This is a natural defense response of our egoism. This is the way we regard the entire world. I look at my child and somebody else’s child. My child is always at least better somehow in my opinion. I always put myself in a more beneficial position; otherwise, there is no reason for me to exist. The egoism’s defensive reaction is directed towards providing me with support that I have the right to exist, and I exist. But when I rise above me, I see others through completely different eyes. In the News (from Bloomberg): “The euro-area jobless rate rose to a record in November as the fiscal crisis and tougher austerity measures deepened Europe’s economic troubles. My Comment: We must agree that there is no returning to the consumer society, and the sooner we switch to a new integral thinking (reasonable consumption, equal sharing, closure of all the “excess” enterprises, the establishment of a rational economy, without anything extra), the less we will lose in transitioning to the new phase of development. In the News (from HealthDay): “Having pots of money doesn’t necessarily make you happy, study after study has found. But giving away money – even if you’re not rich – is likely to make you feel wealthier, and thus happier, new research contends. “Giving $500, he calculated, has the same effect on feelings of subjective wealth as earning an extra $10,000 in income. My Comment: Psychologists do not view a desire as matter or its fulfillment as the sensation of life. That is why for them physical actions are indicators and not the sensation of fulfillment. Kabbalah does not take into account the actions themselves, but only their essence and the resulting fulfillment. Therefore, it relates to giving money, energy, and time not to bestowal, but to a hidden form of reception, of filling oneself. In the action of receiving, a person is limited, but in the action of bestowal, he is not limited by anything, and thus this method of fulfillment is available to everyone. The problem is only psychological, understanding that by giving you can be fulfilled indefinitely. This problem is solved by integral education. Question: I don’t understand how a person can despair of his own powers and cry out if I simply feel tired of everything and throw it all aside when things get tough? Where should I stop and feel despair? Answer: We don’t know in advance where we should stop. If the outcry is planned, then it isn’t a cry of despair. A cry of despair has to come from inside you without any prior planning as one sees that he has no other choice. If you feel confused and are too tired and don’t know which way to go, it is an indication that you don’t feel that the goal is important. Now the goal doesn’t seem important to you, and you don’t understand why you are making such efforts. Once you were full of energy and chased different pleasures and wasted your powers. What nonsense does a person do during his lifetime and all just to feel some fleeting pleasure? Sometimes you lie on the couch and don’t want to get up since there is nothing to get up for, and sometimes you get up and run, losing your head, ready to do anything. It all depends on how important you feel the goal is, which is the main thing we should attain. The importance of the goal is the importance of bestowal, the importance of actions that are far from self-interest, which I cannot perform since I am not motivated to and have no fuel to perform them. How can I do something in which there is nothing for me? My body cannot move in such a case. Our whole world works only on the energy of the desire to receive, that receives a filling, pleasure, reward. But if I don’t see a reward, I cannot do anything. Thus the Creator gets close to me and takes away my last powers to do anything. The attribute of bestowal comes close to me, and I don’t feel that I am motivated to do something, I actually cannot move. Fortunately the attribute of bestowal doesn’t dress in the levels of the still, vegetative, and animate nature; otherwise, all the electrons, all the molecules, all the protein matter would stop and my body would freeze and become motionless; it would die, and disappear. Luckily the attribute of bestowal gradually comes closer and is dressed only in the “speaking” level in me. But the moment it gets close to my shattered egoistic desire, I immediately feel that I am losing my energy, the fuel, the power, the motivation. So what can I do? The Creator’s getting closer at this point is meant to deprive me of the egoistic motivation and to force me, having no choice, to turn to the group. From it I will receive the impression as to the importance of connection, advancement, the greatness and the importance of the goal. I will be able to work by using the group’s fuel. All this is necessary in order to help me adhere to the group and start bestowing upon it. By such actions I am incorporated in the group and I receive its values. I want to be with everyone because I respect them and see them as my group. They help me and they seem great and important. A person submits to the environment and has to make special efforts to be incorporated in it. To the extent that I am incorporated in the environment, I receive a unique quality. It is a special chance that doesn’t exist in any method except the wisdom of Kabbalah. A miracle happens, a special power that influences me as a result of my preparation, and it corrects the shattered vessels in me. These shattered vessels symbolize my readiness for correction. The Light that operates and influences them corrects them. This is called a healing action, like it says: “a remedy for one’s flesh.” Then I really begin to respect and to value bestowal, I suddenly discover in me respect and appreciation for this attribute and want it to be dressed in me. I want to annul myself and to connect with others. Suddenly I have such thoughts and desires that are not typical of my nature at all. But now I suddenly feel such an unnatural yearning and I understand that it is a result of the influence of the Light on me. So we advance. Without a group, there is no way to receive the Light that Reforms, since it comes from the upper system, through the teacher, through the group, through the books until it reaches a person. There has to be a chain. The group is not in the spiritual world yet or may be partly in it. The teacher is in contact with the souls of the Kabbalists that preceded him, with his teachers, and a person connects to the group through the books, dissemination, and working together, and thus connects to the goal by ensuring himself a connection with the source of the Light. Do I Raise My Head To Look At A Friend? Question: Is it possible to hasten the awakening of the point in the heart in a person? 1. An external action—by disseminating our materials, integral education, books, films, etc. 2. An internal action—by the connection among us, which influences everyone else even if they are not aware of it through the system in which we are all connected. Question: Can this drawing illustrate the external and the internal work in the group? Answer: Yes, it can. The upper part (in red) is the work of the points in the heart of the group, while in the lower part (in blue) are all the desires to receive of the group. All this belongs to the same “body” of the group. Answer: No, this isn’t the spiritual work. 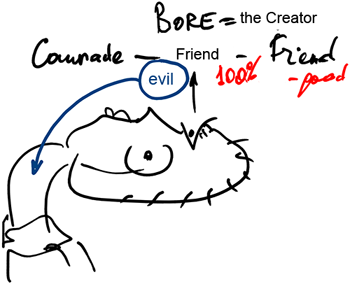 I don’t need to correct the friend’s attributes in me, since if he is a friend, it means that the Creator is behind him. So I look up to him and to me he seems perfect, corrected. If I see that there is something wrong in him I immediately attribute it to myself. So I don’t have any complaints about the friend. On the contrary, I have only complaints about myself. On the whole, I have to constantly show the friends a high spirit, confidence and joy in the spiritual path, and also to worry about the group internally so that through me the friends will receive the Light that Reforms. 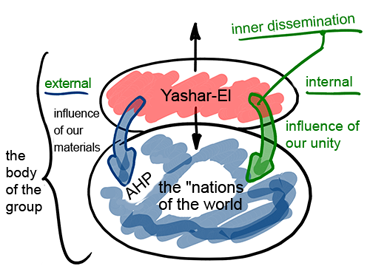 Baal HaSulam, Introduction to The Book of Zohar, Item 66: Bear in mind that in everything there is internality and externality. In the world in general, Israel, the descendants of Abraham, Isaac and Jacob, are considered the internality of the world. “Israel” are those who have an inclination for the three lines, for bestowal. These three lines symbolize Abraham, Isaac, and Jacob—and Israel aspire to integrate them so that the force of bestowal and the force of receiving will connect and reach adhesion with the Creator in the middle line. After all, there are only these two forces in reality—the force of receiving and the force of bestowal. The first refers to the created being and the second to the Creator. If the force of bestowal is also in the created being, a spark or a point in the desire to receive, then by that the created being can build the middle line. The desire is the left line, and the point in the desire, the spark from the Masach (screen) before the shattering, is the right line, and the Light that was summoned to operate on welding them provides the middle line, above reason, bestowal above receiving. So we need the desire and the point in it (●) and also the tension (∆) between them, due to which a person feels bad. Then his point receives an urge to become acquainted with the Creator. And in this case, all of his desires become a means that helps the point in the heart reach the Creator. That is why the Light initially, by descending, created a desire as powerful as itself. Now when the created being uses this desire, he can reach the Creator and rise to Him. 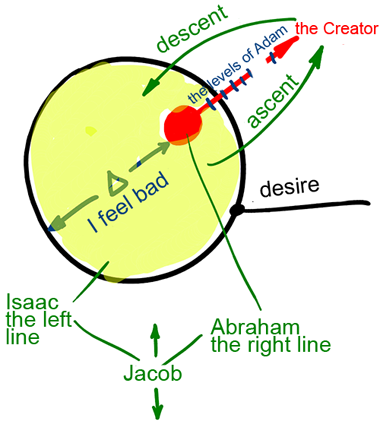 “Abraham” is the point of bestowal, and when a person uses it correctly and looks at the desire from it, he is called “Isaac.” And then there is the combination of them, “Jacob,” the middle line. We need these three components. Question: If the Light and the desire have the same power, where does the difference (∆) between them come from? Answer: The spark of Light, or the Creator, enters the desire and evokes in it a feeling of another nature, of another essence. Then a person feels bad because of his dissimilarity with this nature in the use of his desire. The truth is that none of us knows what the desire to receive is, but everyone knows its benefits. So we are not speaking about the desire but about the intention of in order to receive; we live in the egoistic intention and not in the desire, and it is not felt in itself. Our whole perception, our whole program, is based only on our intention, on our self-centeredness. The difference is not between two desires, the desire to receive and the desire to bestow, but between two basic characteristics. I compare them not according to size but according to a qualitative difference. In fact, I feel the difference, the gap between the Creator and the created being. This is what pushes me to start the path to the level of the Creator, to an equivalence of form with Him. Otherwise I wouldn’t receive such an urge. Then I climb up the levels of resemblance, the levels through which a person brings himself to an equivalence of form with the Creator. There are people in whom there are three lines and others not. In fact, they exist in everyone since eventually everyone has to reach the same state. The shattering was total, the incorporation was total, and the correction also has to be total. Still, the three lines are not expressed in everyone at the same time. In the general desire there is an upper part—GE, or in other words those in whom the point in the heart (•) has already risen and been revealed, and there is a lower part, AHP, those in whom it is still concealed below. Accordingly, those above are drawn to unity (Yechud), to the Creator, and so they are called “Jews” (Yehudi). Below, people have a huge amount of desires, each one seemingly living in his own world—and so they are called “the nations of the world.” Above, everyone wants to connect to one point by which to reach the Creator and below, this point has not been revealed yet and still means nothing, and so the different desires draw people in different directions. But “the individual and the general are equal,” and every person is a small world, so this system, this structure, already exists in every one. Even if the point is revealed in a person’s heart, there are also many other desires, although they may be concealed at the moment waiting for their turn. Everyone has desires that in the meantime do not accompany the point in the heart. Still, the people who have received the basis for the three lines from Above have to feel that they are responsible for the correction of the world. I didn’t expect that we would experience what we did in the past convention. It is a very important stage: We felt what it is when one says to rise above ourselves, to make room for the friend, for the other in your place, to be integrated into the other, to connect with him. We experienced all kinds of feelings like these: When all of us enter one point and no one takes any room, and thanks to self-annulment, there is room for everyone. The same thing was said about the holy temple: Everyone stands closely in a crowded mass, but when everyone had to bow down, then there was enough room for everyone. We went through many states. First, we tasted them, and this tasting is very important. Since, actually this accompanies the entrance into the transition stage. Until now we didn’t know how to interpret, how to feel our state. We said words without knowing what lies behind them. And now a sensation was created: We feel that we are standing next to a psychological barrier, near a barrier that we cannot pass with our own strength, and here without doubt help from Above is needed. It is simply essential, but we must invite it since the Light doesn’t arrive if the Kli is not ready for it. This is the way Lights and Kelim are built. For the first level that we want to rise to, the law is the law, and we advance to such a desire that will be compatible with the Light of this level. We don’t stop. It is forbidden to do that. We still need to discover this gate, the gate of tears, the gate of entrance, the request for correction, MAN (Mayin Nukvin). We ourselves form them: since there are no Kelim nor ever will be that are immediately ready for work. We are the first in this. Our fathers greeted us, those who laid the foundations of Kabbalah, those who created the Kabbalistic system, who discovered the upper force and all the levels that are between the Lights and the Kelim. But we are the first in actualization from below to above, real pioneers. We have a great responsibility for the whole of humanity. We hope that we will be able to lead them correctly via the way of the light and not by way of suffering. Exactly now, according to the events in the world we see, we are approaching the decisive point of choice between these two ways. It all depends on us. And the main thing is to check oneself by the desire of the upper. Even though we advance according to the spiritual laws, above them stands the desire of the upper, which we can oblige, by rising above the way of “in its time,” above the permanent opposition between the Lights and the Kelim, and can accelerate the way with the help of Hassidim (mercy). To the extent that we are drawn to this, to this extent the mercy will operate bestowal, love, renouncements, completion, and self-annulment between us, to this extent we will invite on ourselves the influence of the Light above the law. Since in this, we show our correct readiness to bend our head and receive the way before the Light commits us to do so. We ourselves force ourselves. We hope that we will quickly make the breakthrough and discover the Light’s influence on us. It is clear that this needs to turn into a habit where each one feels that everyone belongs to the Kli, one desire, one family, one soul. Only this is the creation and we are parts of it. Now our perception is cloudy, and in our world it seems to us that each part exists as if by itself. But in spirituality, there only exists a perfect whole. If we can connect and unite, like two liquids or like drops of molten metal that merge into one, in essence, it will be the spiritual state between us. Within it there is no one who is separated, only all of us together. And afterward the concept “we” also disappears and what is left is only one Kli for the Light.